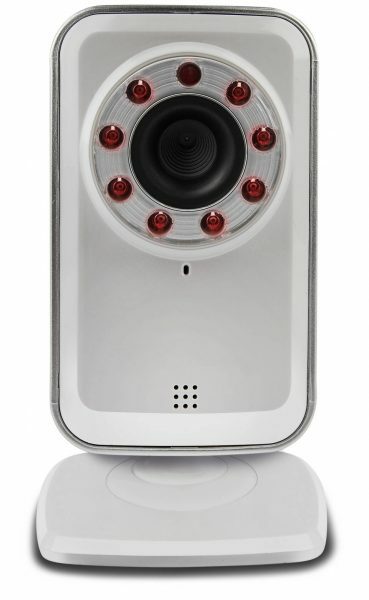 The SwannSmart Camera is a nifty little device, which not only acts as a security camera, but also features infra-red LEDs for night vision monitoring, a microphone so you can hear sounds, a motion sensor to detect motion. All this with built in connectivity for Wifi or wired LAN means that the information from this is accessible via your computer, as well as Android, iOS and Blackberry devices. The thing with such gadgets is that they are often defined by how complicated the setup is. We were pleasantly surprised with the SwannSmart Camera. The setup was fairly straight forward. There are two ways to connect this to the internet. LAN or Ethernet. Since we already have enough wires lurking about our desks, we went for the Wifi option. Setting up Wifi is very similar to how the Cambridge Audio devices were setup. The camera transmits its own network, and once you connect, you can access the camera and set it up to connect to your Wifi. This has to be done via the app though. You also need to create an account with SwannSmart, but that is a straight forward process as well. This is required so you can add your camera to your account, and this provides the security that you want from such a device. You don’t want anybody randomly peaking at you through your security camera, do you! Once you’re setup, all you need to do is click on your SwannSmart app, and it basically lets you watch/listen what is in front of the camera, whether it is light or dark! Yes, this camera brings with it the magic of night vision. This means that wherever you put it, it will be able to see in the dark, and take photos as well as sound for you. This means that this can act as a perfect baby monitor, specially if you are away! We obviously tried this and found it to be pretty perfect. The image is shown in Black and White, but it is good enough for you to see what is going on. However, the nature of infra-red is that it may bounce off your windows. We only say this because we put this on the inside of our window, and when night fell, all we could see was one bright spark. That was because all the infra-red was bouncing off the window into the camera! Another feature with this camera is that you can record videos, as well as take snapshots. Another feature that this packs in is motion detection. This is probably the most important feature if you want to use this for security reasons. You do have to sign up, with a free month’s trial to start off. You have to pay $5.99 a month for this service, so the trial is good enough to let you know if it worth it or not. Similar to the above service, this is another paid for service. This allows you to store images/video on their cloud service for up to 30 days. Of course, you may want to get more than one of these, have one in each room, or have them set up at different places. The beauty of having them connected to the internet is that, yes, it is very much possible to do so. Just add cameras to your account, and you can access them all from your device. Much like the above, yes, you can share your images and streams with family and friends as well. This is done through a secured network, and only through an invite. So, with all this wonderful technology at your disposal, if you are wondering about security, feel rest assured. SwannSmart use 128-bit SSL encryption. While that may not mean much to you and me, it is the same level of security that banks and other e-commerce services use. In the UK, this can be bought from the likes of Maplins for an RRP of £89.99. So, what do I think? Quite frankly, this is brilliant! Gone are the days when have a CCTV setup cost hundreds and thousands of pounds. Whether you want a fancy baby monitor, a CCTV camera, or just a security device, this works well. The price puts it at a sweet spot, and the ease of use makes this quite a brilliant device. The SwannSmart is a no-brainer if you are in the market for a security camera!